Section One considers the costs of healthcare in Alberta and the current data trends. It covers topics such as private verses public, explicit verses implicit costs and the impact of ageing. It also breaks out costs to show trends in different elements of health care such as hospitals, physicians, pharmaceuticals, etc. Section Two puts Alberta's healthcare costs in perspective, using international, national, and provincial considerations of affordability. It looks at costs in the context of population growth and inflation as well as that size of the economy. The appropriate measures of "sustainability" as well as the question of rising healthcare costs are addressed, while recognizing there is no right level of expenditure on healthcare. This report is based on research conducted for Parkland's September 2008 report Sustainable Healthcare for Seniors: Keeping it Public. 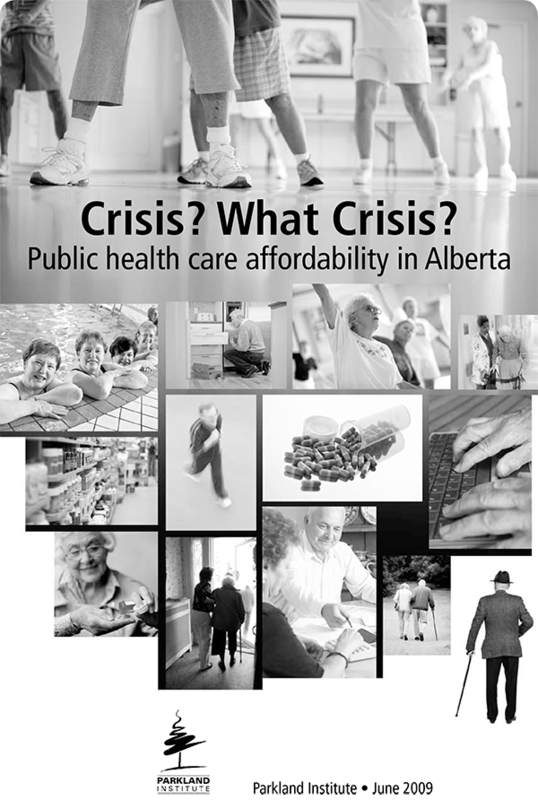 That report was conducted to evaluate the situation for seniors' healthcare in the province of Alberta. It included a strong analysis of the affordability of health care in the context of an ageing population. The following is a summary of the key aspects of affordability that will be looked at in more depth in this report. It is clear that the Alberta government is obsessed with the affordability or sustainability of the publicly funded health system. Consider the following, a typical government statement: "there is no question that long term sustainability is a major challenge of Alberta's publicly funded health system." In reality, the introduction of Medicare in the 1960s stabilized Canadian healthcare expenditures, which had been on a runaway trajectory similar to the United States. Canadian innovation in public financing of health has kept healthcare affordable while the United States has continued on its escalating trajectory with largely private funding. Sustainability is a matter of whether the people of a jurisdiction can afford a given level of care. The relevant financial ratios in this analysis are healthcare expenditure to GDP, debt to GDP, and healthcare expenditure to total public expenditure. Of course, there is no standard as to what the people of a jurisdiction should spend on healthcare. This will depend on their wishes. However, national income will be the budget that limits their spending. Alberta has the highest GDP per capita of any province, but healthcare spending in GDP terms in Alberta is low by any comparison - a fraction of the Canadian average. It is extremely low using international comparisons, and in particular in comparison to the US, which has the highest ratio of health spending to GDP in the world (60 percent higher than Canada's). Public healthcare expenditure in Alberta is a very low fraction of overall income, currently at approximately four percent of GDP. The current level is also low compared to the level in the mid-1990s, and has remained relatively stable over the last 10 years. GDP in Alberta has grown at an annual rate of 4.2 percent per capita in the last decade, far outstripping the projected increase in healthcare costs of 1.32 percent. At these rates of GDP growth and healthcare expenditures, healthcare expenditures would fall in relation to GDP. Clearly from a GDP measure of the productivity, income, and the wealth of Albertans, current healthcare expenditures are affordable and sustainable. Moreover, Albertans could spend much more on healthcare and remain low compared to other jurisdictions in Canada and abroad. Canada is by far in the best fiscal shape of all the G8 nations, with the lowest debt/GDP ratio, one that has steadily declined in recent years with government surpluses and robust growth in GDP. With a low debt/GDP ratio Canadian healthcare expenditure (as a ratio of GDP) is easily manageable in comparison to other countries. Alberta is even better off, as it has no deficits or debt and has been running large surpluses every year since 1996. In fact, Alberta has been accumulating large net financial reserves since 1999. Although healthcare spending has been rising as a proportion of the overall provincial budget, it has not been rising as a proportion of GDP. Instead, government expenditure has been cut in relation to GDP. Under Premier Klein's tenure, government's share of the overall economy fell from 22 percent of GDP to 12 percent - a 45 percent reduction. Despite what government officials might argue about the sustainability or affordability of the healthcare system, the situation has now changed. With oil prices already rebounding, Alberta's savings and surpluses will more than adequately cover the costs. However, if Albertans decided to increase taxes there is considerable tax room to do so. Alberta is the only Canadian province without a sales tax, and in 2000 Alberta cut income taxes - mainly for the wealthiest - foregoing over $2 billion dollars a year in revenues. Although Alberta need not raise revenues to pay for healthcare improvements, it has the tax room to do so. Thus unsustainability claims seem less a genuine concern, and more a smokescreen for a particular ideological perspective. The Klein era was one of diminishing the public sector share of the economy and attempting to reduce healthcare costs wherever possible. This effort has paid off only in demolishing or privatizing public assets, increasing the inefficiencies in healthcare, and overextending healthcare workers. It is clear that healthcare costs will occur, and they will likely increase. Reducing public expenditure will not make them go away; it would only shift them to personal out-of-pocket expenses, for those who can afford it, and private insurance for those who have it. Or it will drive costs into the implicit realm (costs not accounted in exchanged dollars) where it increases stress on caregivers, increases absenteeism from work, and reduces productivity and GDP. Most importantly, shifting costs will undermine the highly valued universality and equity aspects of Medicare. Photo credit: Kurt Bauschardt under a Creative Commons licence.